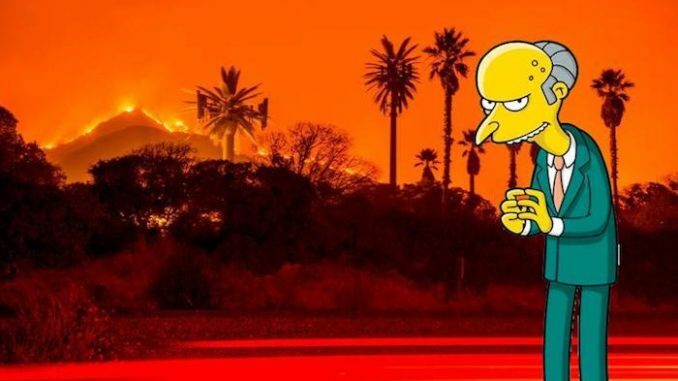 An old episode from The Simpsons has surfaced in which the California wildfires are shown to occur as a result of ‘Directed Energy Weapons’ (DEW). The episode, titled “Monty Burns’ Fleeing Circus,” originally aired on September 25, 2016. When a fire levels Springfield, Mr. Burns agrees to the Simpsons’ pleas that he fund the town’s rebuilding, on the condition that he gets to put on a variety show. Matthew Abraham Groening is an American cartoonist, writer, producer, animator, and voice actor. He is the creator of the comic strip Life in Hell and the television series The Simpsons, Futurama, and the upcoming Disenchantment. The Simpsons is the longest-running U.S. primetime-television series in history and the longest-running animated series and sitcom. What is up with the Simpsons? Is Matt Groening a prophet? Or some think a government agent.